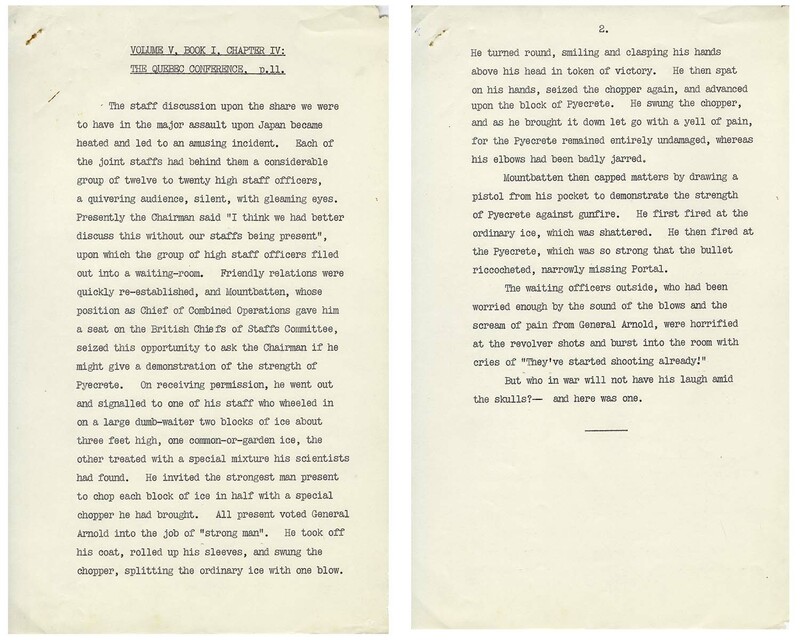 Unpublished draft from Winston Churchill's WWII memoir, ''The Second World War'', here recounting an amusing (and previously anecdotal) story of Lord Mountbatten shooting a pistol at a block of Pykrete, a new technology mimicking ice. Draft is possibly from Churchill's own typewriter, distinctive for its larger font, and comes from the estate of Commodore Gordon Allen, who helped Churchill write the naval portions of the memoir. At the Quebec Conference in 1943, Churchill remembers, ''...Mountbatten...signalled to one of his staff who wheeled in on a large dumb-waiter two blocks of ice about three feet high...He invited the strongest man present to chop each block of ice in half with a special chopper he had brought. All present voted General Arnold into the job of 'Strong Man'. He took off his coat, rolled up his sleeves, and swung the chopper, splitting the ordinary ice with one blow. He turned round, smiling and clasping his hands above his head in token of victory. He then spat on his hands, seized the chopper again, and advanced upon the block of Pyecrete. He swung the chopper, and as he brought it down let go with a yell of pain, for the Pycrete remained entirely undamaged, whereas his elbows had been badly jarred. The story of Mountbatten shooting at the Pycrete has been mentioned elsewhere, but details such as the damage of the ricocheting bullet have differed, with Churchill now adding his recollection to the record. Two page draft measures 8'' x 13'', on two separate sheets. Staple holes to upper left, and a bit of chipping, overall very good condition.